The same verse can be found in II Chronicles 4, 2. It occurs in a list of specifications for the great temple of Solomon, built around 950 BC and its interest here is that it gives π = 3. Not a very accurate value of course and not even very accurate in its day, for the Egyptian and Mesopotamian values of 25/8 = 3.125 and √10 = 3.162 have been traced to much earlier dates: though in defence of Solomon's craftsmen it should be noted that the item being described seems to have been a very large brass casting, where a high degree of geometrical precision is neither possible nor necessary. There are some interpretations of this which lead to a much better value. The fact that the ratio of the circumference to the diameter of a circle is constant has been known for so long that it is quite untraceable. The earliest values of π including the 'Biblical' value of 3, were almost certainly found by measurement. In the Egyptian Rhind Papyrus, which is dated about 1650 BC, there is good evidence for 4 × (8/9)2 = 3.16 as a value for π. Consider a circle of radius 1, in which we inscribe a regular polygon of 3 × 2n-1 sides, with semiperimeter bn, and superscribe a regular polygon of 3 × 2n-1 sides, with semiperimeter an. Except for Zu Chongzhi, about whom next to nothing is known and who is very unlikely to have known about Archimedes' work, there was no theoretical progress involved in these improvements, only greater stamina in calculation. Notice how the lead, in this as in all scientific matters, passed from Europe to the East for the millennium 400 to 1400 AD. Al-Khwarizmi lived in Baghdad, and incidentally gave his name to 'algorithm', while the words al jabr in the title of one of his books gave us the word 'algebra'. Al-Kashi lived still further east, in Samarkand, while Zu Chongzhi, one need hardly add, lived in China. which converges much more quickly. The 10th term is 1/(19 × 39√3), which is less than 0.00005, and so we have at least 4 places correct after just 9 terms. With a formula like this available the only difficulty in computing π is the sheer boredom of continuing the calculation. Needless to say, a few people were silly enough to devote vast amounts of time and effort to this tedious and wholly useless pursuit. One of them, an Englishman named Shanks, used Machin's formula to calculate π to 707 places, publishing the results of many years of labour in 1873. Shanks has achieved immortality for a very curious reason which we shall explain in a moment. Shanks knew that π was irrational since this had been proved in 1761 by Lambert. Shortly after Shanks' calculation it was shown by Lindemann that π is transcendental, that is, π is not the solution of any polynomial equation with integer coefficients. In fact this result of Lindemann showed that 'squaring the circle' is impossible. 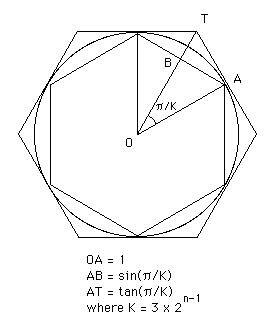 The transcendentality of π implies that there is no ruler and compass construction to construct a square equal in area to a given circle. Very soon after Shanks' calculation a curious statistical freak was noticed by De Morgan, who found that in the last of 707 digits there was a suspicious shortage of 7's. He mentions this in his Budget of Paradoxes of 1872 and a curiosity it remained until 1945 when Ferguson discovered that Shanks had made an error in the 528th place, after which all his digits were wrong. In 1949 a computer was used to calculate π to 2000 places. In this and all subsequent computer expansions the number of 7's does not differ significantly from its expectation, and indeed the sequence of digits has so far passed all statistical tests for randomness. We should say a little of how the notation π arose. Oughtred in 1647 used the symbol d/π for the ratio of the diameter of a circle to its circumference. David Gregory (1697) used π/r for the ratio of the circumference of a circle to its radius. The first to use π with its present meaning was an Welsh mathematician William Jones in 1706 when he states "3.14159 andc. = π". Euler adopted the symbol in 1737 and it quickly became a standard notation. There are many of us, many Englishmen and many Germans, who said things during the War which we scarcely meant and are sorry to remember now. Anxiety for one's own position, dread of falling behind the rising torrent of folly, determination at all cost not to be outdone, may be natural if not particularly heroic excuses. Professor Bieberbach's reputation excludes such explanations of his utterances, and I find myself driven to the more uncharitable conclusion that he really believes them true. Brouwer's question: In the decimal expansion of π, is there a place where a thousand consecutive digits are all zero? Another normal question! We know that π is not rational so there is no point from which the digits will repeat. However, if π is normal then the first million digits 314159265358979... will occur from some point. Even if π is not normal this might hold! Does it? If so from what point? Note: Up to 200 million the longest to appear is 31415926 and this appears twice.